It becomes clear at this point in Victor’s memoir, Chaps. 4 & 5, that he has such great admiration for the ‘genius’ of Dylan that he begins to meld his personality into Dylan’s person and persona. 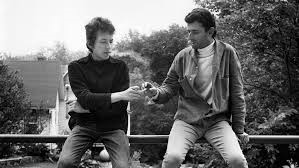 Being six years older and considering himself more worldly wise thus a guide to the younger more naïve Dylan he feels actually superior to Bob, or at least compensate for his felt inferiority. He thus becomes protective and paternalistic. Dylan must have found the attitude annoying. In Chapter 4 that concerns Dylan’s 8/22/64 meeting with the Beatles in New York City, he actually does displace Dylan assuming his role. This meeting is perhaps the most famous incident in rock and roll history. This ‘summit’ meeting arranged by the journalist Al Aronowitz of whom more below is when Dylan is said to have introduced the Beatles to marijuana. The below is Victor’s gloss on the story. Victor’s relationship with Dylan has almost supernatural aspects. While he realizes that Bob has the gift and he doesn’t his admiration and perhaps envy is so great that as time goes by he seems to be melding his persona into Bob’s almost to the extent that he becomes an incubus attempting to inhabit Bob’s mind and body almost like an internal double. 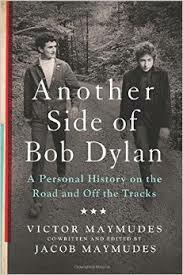 Aronowitz arranged the meeting between Dylan and the Beatles but his account is truncated on the website. The Blacklisted Journalist offers only a teaser of the story referring you to his book Bob Dylan And The Beatles, now out of print. A used copy is costing me 75.00 and it had better be worth it. I will probably rewrite this section when I receive it; but for now Victor’s version and, really, this is Victor’s story. This is a great moment for Victor and he does it justice in the telling. He borrowed Bob’s muse to write it. You should probably read Victor’s account for the full flavor. It will suffice here to show how Victor elbowed Bob out of the story. His account begins with their arrival at the Delmonico Hotel where there is an immense crowd blocking the entire street and gathered beneath the windows of the Beatles’ suite. If you were checking in as a guest at that time it would have been one of the major events of your life, if the police had allowed you through to check in. The roar as Victor describes it begins as persistent white noise like the ocean surf as Dylan’s group approaches mounting in volume to a tremendous roar at the hotel door. On the Beatles’ floor, which is sealed off, the glitterati being more privileged than the hoi polloi replicate the scene below as they crowd the hallway. PP&M, the Kingstons, everybody is there, everybody. Probably Truman Capote and Andy Warhol. It staggers the mind that four unknown musicians could create such an uproar. One imagines the glow of importance on Victor’s brow as he surpasses all the glitterati to enter the Beatle’s suite with Bob and Al. One of the chosen. Introductions finished, the pot comes out. This is the first time the Beatles were to get high on pot although with a knowing wink Victor explains that they have smoked some inferior stuff before with little TCP content. Bob undertakes to roll a joint but bungles the job. Now here’s were Victor takes over Bob’s role. He reaches over and takes the papers and weed from Bob’s hands. I would have fired him on the spot. Victor then rolls perfect numbers for all concerned. Bob takes a couple swigs from a bottle and then passes out on the floor. From that point on in Victor’s account he is the show; he has become Bob or Bob has become him. The Beatles are suitably impressed becoming Victor’s great friends. For a brief moment Victor and Bob were one in Victor’s mind. His account is a fully detailed extended account well worth reading. I will compare it later with that of Aronowitz. Aronowitz himself was a journalist, the music and entertainment reviewer with the New York Post. He seems to have had Victor’s need to become those he reviewed. He had a long and illustrious career breaking Billie Holliday among others in music and the movies as he says. When the Beatles landed, recognizing the next big thing he moved in on rock and roll. Being able to deliver Dylan to the Beatles was his big coup hopefully establishing him with the two biggest pop acts ever. After the Beatles-Dylan encounter however his career went into decline. As he says on the Blacklisted Journalist neither Bob nor Victor would talk to him anymore. It seems as though the whole rock world rejected him. Perhaps he appeared to be an opportunist from another era or generation and wasn’t wanted. And then he did something to cause him to be blacklisted as a journalist. Chapter 5 concerns Bob, Victor, Paul Clayton and Pete Karman’s cross country tour from New York, down through the South and out to San Francisco. Victor gives a very nice sketch of Paul Clayton one of the premier folk musicians and musicologists of the period. I will highlight the visit to Carl Sandburg here as Victor gives the fullest and best account that I have read. Carl Sandburg was of course the Chicago poet- Chicago, Hog butcher to the world, tool maker, stacker of wheat, player with railroads…city of big shoulders, etc. etc. as well as the author of the Pulitzer Prize winning biography of Abraham Lincoln. Also he was the compiler of the American Song Book, published in 1927, a collection of songs roughly from the turn of the twentieth century that contains nearly the whole of the sixties’ repertoire- Midnight Special, Stack-o-lee, alternate versions of St. James Infirmary, Nearly everything that has been attributed to Huddie ‘Leadbelly’ Ledbetter. I think most people think Ledbetter wrote The Midnight Special. I did until acquiring a copy of the Son Book at an estate sale. Apparently he must have had an early copy of the Song Book. Bob says that he wanted to talk to Carl about the collection. Victor gives the fullest and best account of the encounter. Bearing in mind that this gang of four burst upon the Sandburg’s unannounced they sprang on the Sandburgs’ like a summer squall. Mrs. Sandburg who was sitting on her porch greeted them graciously going in to get her husband. Remember this is 1964 and this rag tag bunch with wild hair, manners disordered by drugs, sort of exploded from the car onto the lawn. Perhaps Mrs. Sandburg was terrified. Sandburg himself being an old trooper from the hog butchering capitol of the world rose to meet the challenge. According to Victor Sandburg spent an hour with them. In this scene Victor hung back while the bumptious Pete Karman shouldered Bob aside trying to monopolize Sandburg. Sandburg, pushing ninety, tired, excused himself and returned to his nap or whatever, perhaps practicing banjo licks. Victor’s account clarified this situation that has always puzzled me. Sounds about right. Victor gives a good account of Bob in New Orleans and the trip West through Colorado to San Francisco. Altogether two very worthwhile chapters. Good enough for general reading in my opinion.